How to Paint a Hummingbird, step by step tutorial on painting a beautiful hummingbird in acrylics. Beginner friendly! 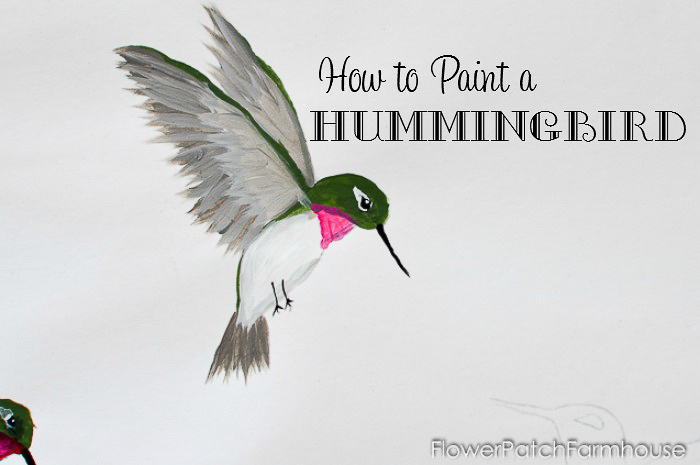 I know you are going to love how to paint a hummingbird! You might have thought that it was an intimidating feat but really when you break it down one stroke at a time it is much easier than you imagine. 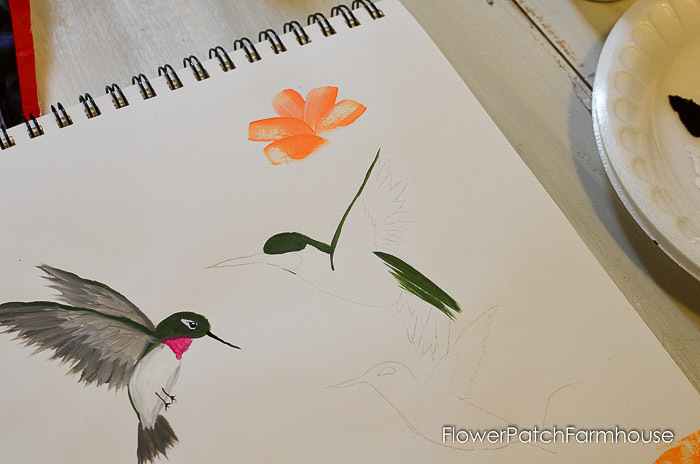 Hummingbirds come in so many different colors and even shapes that you can have a great time painting up a few. 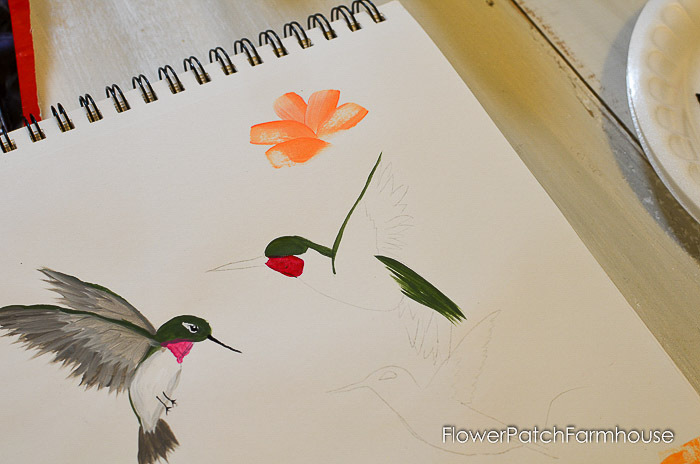 Soon I will do a collection of designs with hummingbirds included so practice getting the hang of it and the paintings will be so much easier for you. I took a photo of a hummingbird and made a sketch of it. Then I transferred it to my paper. 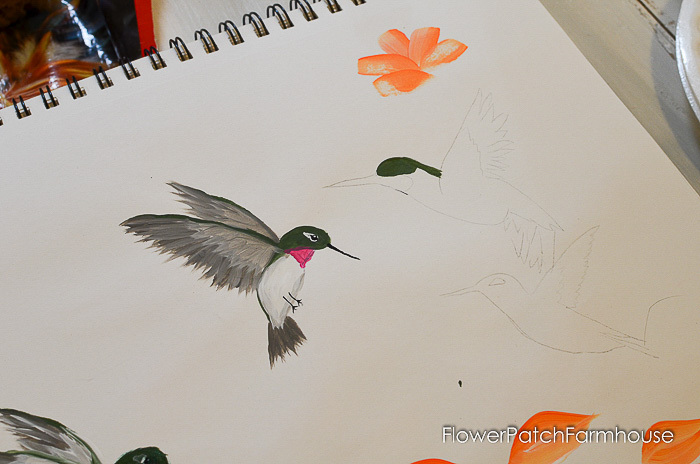 You can see the other hummingbird I painted in the video on the left. He is slightly different than the one we are painting today. I start filling in with the green on his head and upper back. You can paint these any size you like so use a brush that fits or you are comfy with to paint the area. I run a line of green along the top edge of the wing and down his back, I make spiky strokes with the chisel edge of my brush to emulate feathers. You see he has more green on his back than the hummer on the left. Also the red on his face is in a different spot, that is how it is, look at photos of hummers, you will find all sort of markings on them so roll with it and try a few. Add the Alizarin Crimson on his thorat. Just fill it in with gentle strokes. Paint his tummy area white, no worries on exactness as many of your on coming strokes will overlap the tummy. Now on to his wings. 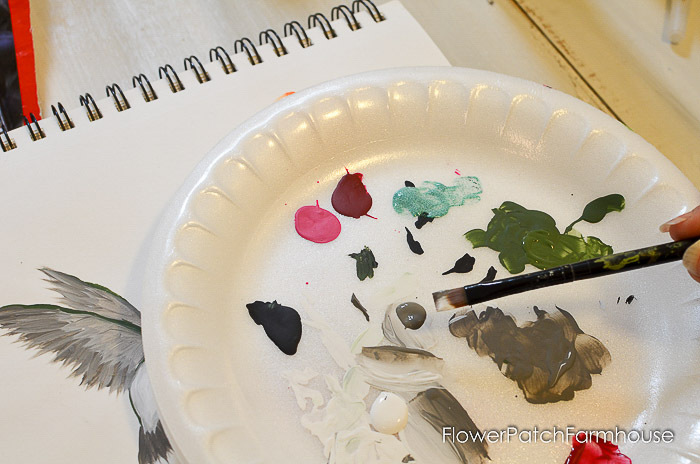 I double load grey and white onto my brush by dipping each corner in a color and blending it into my brush by stroking it back and forth on the palette until the color blend towards the center. I use the same chisel edge strokes to with grey and white for his tail which is swooping forward instead of just facing down. 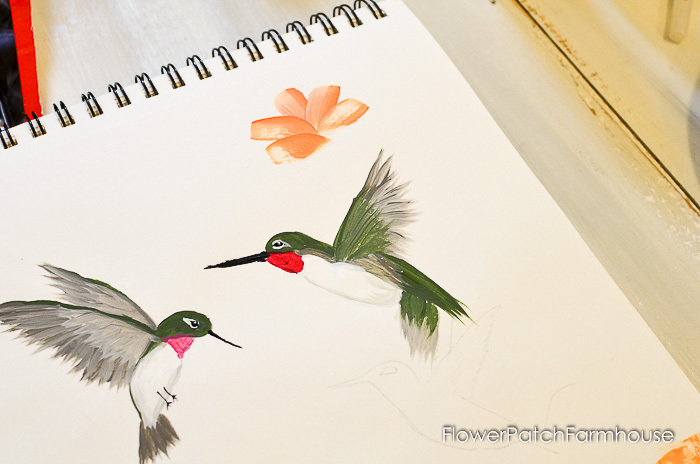 Overlap the grey strokes with green chisel strokes on both the tail and wings. Shade along his body towards his back with the double load of gray and white, leading with the white edge. You can use a liner if you need more control for the beak but paint it with black and so it comes to a point. There is always a point when things look messy, don’t get discouraged, the details make it come to life. Just keep on going. Start with a black dot a third of the way back from the beak. With your liner brush, outline it with the thinnest line you can of white. Now add a tough of highlight of white to the top of the black dot to give it a spark. There you have your hummingbird. 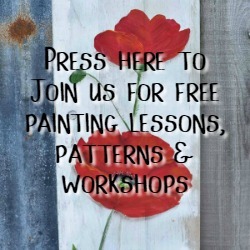 Want new painting lessons and access to printable patterns sent directly to you? Join us by clicking the button in the bar above. I am painting on my Canson Mixed Media paper. This is so beautiful! I love hummingbirds. These are the cutest little hummingbirds! I love them. Pinned. You may it so easy and also show how to correct a poor or incorrect stroke! Couldn’t ask for more! Thank you. It does help when you know how to correct mistakes, we always make them. 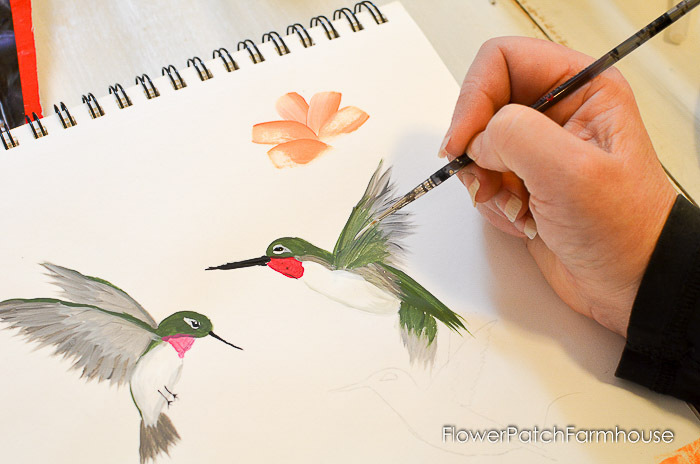 Very nice tutorial…love all types of birds. You make it look so easy! 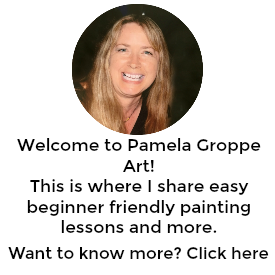 Thank you for sharing your knowledge with us…love watching your videos!! Have question regarding use of a canvas. It says acrylic titanium primed with acid free sizing. Does this mean that you do not have to use gesso on the canvas and do you have to seal it after painting with acrylic paints? I am new to this and finding it confusing! Any clarification that you can give will be greatly appreciated. Thank you in advance!!! !